Aiken County's Crackerneck Wildlife Management Area and Ecological Reserve will be open to the public on the following Saturdays this fall: Sept. 3, 10, 17 and 24 and Oct. 1. Crackerneck Wildlife Management Area and Ecological Reserve consists of 10,600 acres owned by the U.S. Department of Energy and managed for them by the S.C. Department of Natural Resources (DNR). The area is located in Aiken County, along the Savannah River and southwest of the town of Jackson, off SC 125. Access is through the check station gate off Brown Road. Detailed maps/brochures of the area that include special rules and regulations can be requested in advance by e-mailing caudellm@dnr.sc.gov and providing a name and postal mailing address. Maps are also available at the check station where visitors sign in. The DNR office on the Savannah River Site can be reached at (803) 725-3663. 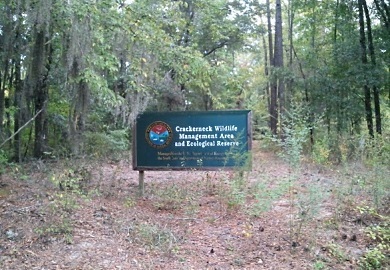 Crackerneck Wildlife Management Area and Ecological Reserve consists of 10,600 acres in Aiken County owned by the U.S. Department of Energy and managed by the S.C. Department of Natural Resources. Crackerneck will be open to the public Saturdays in September and Oct. 1. The Crackerneck area will be open for scouting, fishing and some other outdoor activities. All visitors must sign in before entering and sign out prior to leaving. No managed trails exist on the property. Bikes and horses are confined to the 50-mile road system and selected firebreaks. No weapons are allowed during this period. Hours are 6 a.m. to 8 p.m. Insect repellant is recommended for all users, and recreationists should bring their own water. One port-o-let is located at the check station. Fishing will be allowed during this period. Limited bank fishing opportunities exist at Skinface Pond so small boats are recommended. The bass limit at Skinface is two per person per day with a 14-inch minimum, while the catfish limit is five. Limits on bream are the same as state creel limits. A couple of swamp lakes are also accessible with small boats and will be open to fishing. No bike trails exist at the present time. Mountain bikes are restricted to the 50-mile road system and selected firebreaks. Most roads are improved with crush-and-run but offer relatively smooth riding. Crackerneck Wildlife Management Area in Aiken County offers many picturesque locations for hunters and other recreation enthusiasts to visit when it opens Saturdays during September and on Oct. 1. No hiking trail exists at present, but the 50-mile road system goes through scenic areas and is a suitable alternative. In addition, hikers can utilize a 30-mile network of firebreaks that will get them off the beaten path. The more adventurous hikers can blaze their own trails just as hunters do. 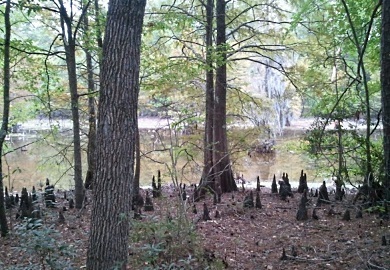 For anyone entering the Savannah River swamp, a compass and/or GPS Unit are strongly recommended. Many people just enjoy touring the road system to see what can be observed, whether it be wildlife, wild flowers/butterflies, old home sites or cemeteries, forestry and wildlife management practices. The entire 50-mile road system can be enjoyably ridden in under four hours. All roads, including jeep trails, are maintained in excellent condition.